Bank of America Merrill Lynch analyst Michael Carrier downgrades Goldman to neutral from buy and slashes his price target on the stock to $225 a share from $280. "While we view the current valuation as discounting most of the potential negative scenarios related to 1MDB, we only have limited information and the uncertainty could linger for a while and limit the upside potential if markets stabilize," Carrier says. Shares of Goldman Sachs fell 2.1 percent Friday after an analyst at Bank of America Merrill Lynch said the stock's gains could be capped as a scandal related to the Malaysian government investment fund festers. 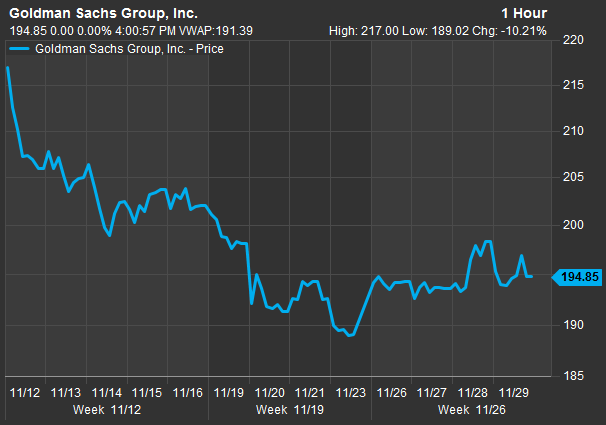 Bank of America Merrill Lynch analyst Michael Carrier downgraded Goldman to neutral from buy and slashed his price target on the stock to $225 a share from $280, still implying a 15.5 percent upside from Thursday's close. The stock traded around $191 before the bell Friday. "While we view the current valuation as discounting most of the potential negative scenarios related to 1MDB, we only have limited information and the uncertainty could linger for a while and limit the upside potential if markets stabilize," Carrier wrote in a note to clients. Goldman's stock has fallen sharply since news broke that the Malaysian government sought refunds of fees it paid the bank for deals related to 1MDB, Malaysia's state investment fund. The deals raised billions of dollars that were later stolen. In that time, Goldman shares have dropped more than 10 percent. But most of those losses came after it was reported that former CEO Lloyd Blankfein attended an introductory meeting with the financier later accused of stealing billions from the fund. Morgan Stanley also lowered its Goldman rating on Nov. 21 amid the scandal, noting it is not clear how long the situation "will take to resolve." Meanwhile, Bloomberg News reported Thursday that the Federal Reserve is ramping up an investigation into how Goldman executives avoided the bank's compliance controls. Former Goldman investment banker Tim Leissner, who pleaded guilty for his involvement in the 1MDB scandal, said this behavior is part of the bank's culture. Goldman "could face fines, penalties and other sanctions, but as of now, we don't expect it to have a [long-term] impact on the business," Bank of America Merrill Lynch's Carrier said. "That said, given that the timing of the investigation is not known, this may take some time, could continue to weigh on GS, and limit [near-term] stock upside." To be sure, Carrier points out that similar cases in the past have ended with penalties ranging from millions of dollars to about $2 billion. Goldman "has lost ~$12B in market cap (~14%) since the beginning of Nov on these headlines … so it appears to us that the stock has more than discounted the outcome. In addition, the headlines shined a negative light on GS during a broader market and sector sell-off, which likely added to the pressure," Carrier said.